Hold onto your hats—and your sunglasses, and anything else that might be loose. The newest member of the Pershing X Generation series has officially premiered. The Pershing 8X promises speeds upwards of 40 knots, to treat you and your guests to thrills on the water. The Italian builder has long focused on performance yachts. So, the series, which includes a few smaller models, too, stays true to Pershing’s roots. 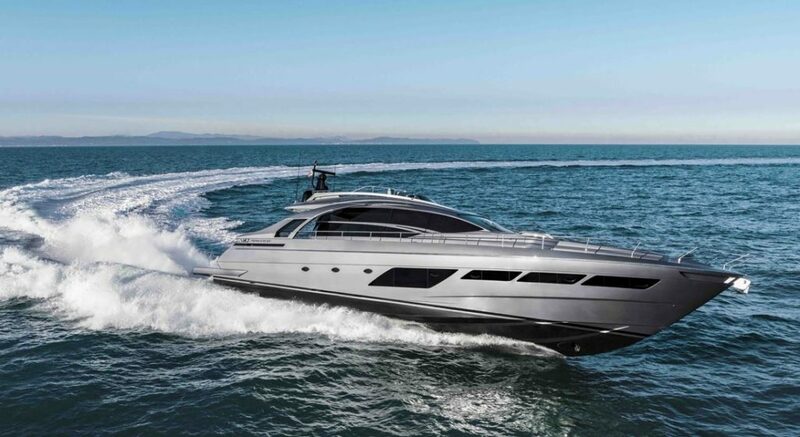 The Pershing 8X results from the collaborative efforts of Fulvio De Simoni, the Ferretti Group Engineering Department, and the Ferretti Group Strategic Product Committee. Bearing an LOA of 83’8” (25.55 meters), the megayacht sees a reported maximum speed of 45 knots with her standard MTU power package. If that’s not enough for you, it’s no problem. In fact, the optional MTU engines permit the Pershing 8X to see an expected top speed of 48 knots. Lightweight construction is a big factor behind those speeds, and equally impressive ones. For instance, if you select the standard engines, you can expect to see a cruising speed of 38 knots. Again, if you crave even better performance, you won’t be disappointed by the optional engines. With them, you should cruise at 41 knots. Either way, it’s enough to leave American shores to enjoy lunch in Bimini and get back well before sundowners time. If you don’t feel like coming back just yet, you can stay aboard with four to six guests. Just as you have a choice of standard or optional engines, you have a choice of standard or optional layout. The Pershing 8X has four staterooms in the former, three in the latter. Both configurations include two crew cabins, which share a head. While the 19’2” (5.86-meter) beam benefits the saloon, open to the triple-seat helm, large swaths of glass all around, including a skylight, make the Pershing 8X feel even more airy. But, to really appreciate the megayacht’s purpose, spend your time on the flying bridge. Super-stylish floating stairs lead up to ample sunpads aft and three observation seats fully forward. While you can sun and stretch out similarly on the foredeck, up here is really where you’ll want to be. The Pershing 8X is on display at Boot Düsseldorf through the next several days.